Aircraft warning spheres are used as a visual marking of overhead power lines crossing fjords, valleys and rivers or generally where there is a need to make power lines visible to aircraft and helicopters. The warning spheres are attached to the shield wires or to the phase conductors, with the wire or conductor always having the highest point. In Norway, regulation “FOR-2014-07-15-980” specify all the details of marking of aviation obstacles. Warning spheres must be visible in daylight at a distance of minimum 1500 meter from all inflight angles. Specific requirements to dimensions and distance between the warning spheres apply. All warning spheres must have a reflective surface. NTP Products AS manufacture and supply aircraft warning spheres according to Norwegian regulation. 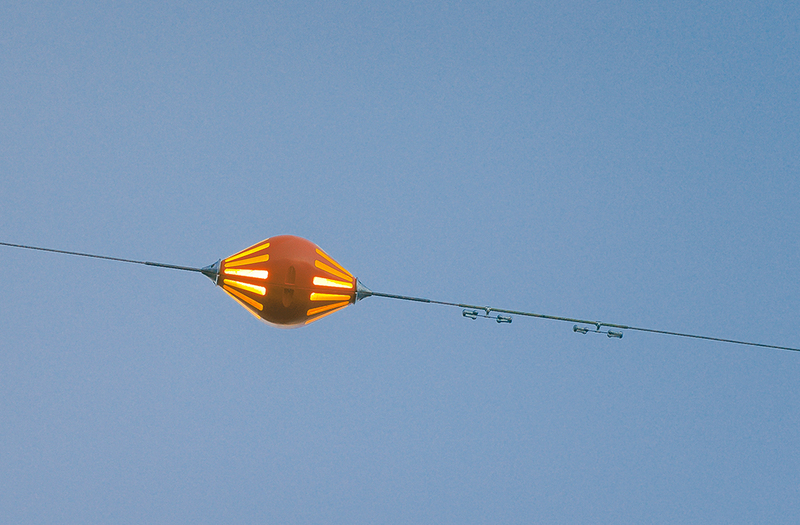 Our warning spheres consist of two elliptical shaped spheres of UV and ozone resistant polyethylene material, which are attached to the power line by special conductor clamps of aluminium. Stainless steel bolts, nuts and washers are used to secure the clamps and the sphere to the line. The design, shape and rigidity of the warning spheres prevent acoustic noise and vibration problems for the lifetime of the power line. The elliptical shape has also an ice-breaking function if built-up ice on the conductor should release and slide towards the warning sphere. Warning spheres from NTP Products AS have been used in the Norwegian transmission network for more than 45 years. Colour: Signal orange RAL 2010, UV and ozone resistance. Reflective surface: 3M reflective sheeting DG4081 fluorescent/yellow. Draining holes prevent accumulation of moisture/water inside the spheres. For installation on all types of conductors, we recommend to install the warning spheres over armour rods.